Lightning is one of the many wonders and mysteries of Mother Nature. It scares the hell out of children and those people who think the odds of getting struck by a lightning are greater than we think. But to photographers, lightning is a beauty that must be captured. Here are some tips on how to take lightning shots. It is important that you know the weather danger first. Of course, you do not want to absorb millions of lightning volts, do you? A sound tip is to shoot lightning photos outside rain. Shoot while the storm is distant. It is foolish to just go in the open field and photograph close lightning. That is very dangerous. Safety should come first. Unless you are a professional lightning photographer, do not take any risks. What camera should be used in lightning photography? One huge advantage of digital cameras is that you can see the lightning shots instantly, so you can make exposure adjustments while the storm is still active. It also costs you nothing to see the results right away. However, there is one negative: Digital cameras are less forgiving than film with overexposed lightning photos. Use a camera that will allow you to use the bulb shutter setting and set the aperture separately. Use a good heavy tripod. You may also need cable release to trip the shutter remotely and hold it open. It is also recommended that you use wide angle lens, preferably 17mm. If you have a digital camera that allows long exposure noise, it is better to turn that off. Set your camera to the lowest ISO speed and shoot RAW. 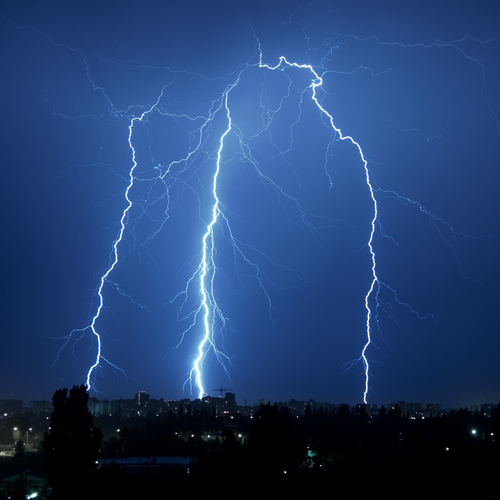 Keep the aperture f/5.6 – f/8 while taking lightning photos. The exposure time largely depends on the light conditions. When shooting at night, use these tips about calculating long exposures for you to know the right exposure. When capturing lightning photos during daytime, you can use your camera’s light meter to know the correct exposure. Finally, your lens should be set on Manual Focus and focus for infinity because the lightning will most likely hit somewhere very far from your lens. You must pay careful attention to composition. The most interesting lightning photos are sky shots that include a bit of land, sea, or city, although there are impressive photos showing nothing but lightning bolts.